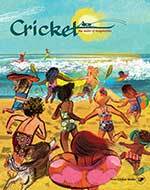 Make a splash this summer with Cricket. While relaxing on the beach or at the pool, you can enjoy stories about rescuing sea turtles, adopting a skittish dog, diving for pearls in Japan, and training a wild mustang. There’s also a crazy Cricket Country picnic (watch out for Ugly’s spitball! Eww! ), a patriotic Crossbird puzzle for the Fourth of July, and a new art contest about the dream you have inside you.